The other day I spoke with a gentleman from Calvary Baptist Church. Pete Hastert, who does everything from electrical work, plumbing and just about all the maintenance of his church. He talked to me in-depth about the history of Calvary Baptist and what led them to buy Screenflex room dividers. He purchased 4 room dividers from us back in September to use while the church was going through considerable renovations. This amazing church has gone through a couple of big tragedies only to be blessed with growth. In 1936 a tornado hit the church building and blew much of the roof away. In 1992 a fire burned down the main sanctuary and after rebuilding the sanctuary ten years later, renovations are underway again and services, preschool classes, and other ministries continue with the help of Screenflex portable room dividers. 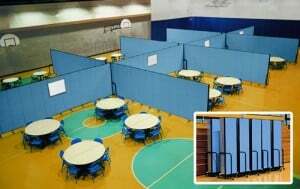 Calvary’s gymnasium is 8,000 square feet (80′ X 100′), so Pete purchased four 16′ x 9″ room dividers to divide the gym in half. Standard room dividers can be strung together with multi-unit connectors to make any length wall desired. To run an MDO (mom’s day out) program, room dividers are set up to create two rooms in the gym. The preschool program can enjoy gym time on one side of the divider and a study group can meet on the other side of the divider. Yearly Valentine’s Day party’s take place in the gymnasium for 360 guests. Calvary sets up room dividers to create a smaller dining area for the party. Multiple events can take place at the same time. Dividers are used for creating backdrops for shows. While the kitchen is under renovations, a temporary kitchen is set up in the gymnasium where coffee, ice, and food items are set up for the church members using room dividers. Small rooms are created during conferences and study groups for a cozier atmosphere.